McCormick Ground Marjoram is pleasantly aromatic and has a distinctly minty-sweet flavor with slightly bitter undertones. 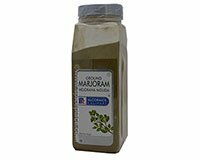 Ground Marjoram is the ground dried leaves and floral parts of the herb Origanum majorana. Marjoram is considered a species of oregano and, thus, its current scientific name. McCormick Ground Marjoram may be used in the preparation of lamb, pork, beef, veal, venison and other game, as well as with chicken, broiled or baked fish, shellfish, tomato dishes, vegetables, pizza, spaghetti, brown sauces, stuffings, egg dishes, breads, tossed green salads, salad dressings, soups, and oyster and clam chowder. Marjoram is an important ingredient in Italian, French, the Middle Eastern, and Latin American cooking. Ingredients: Ground Dehydrated Marjoram Leaves.